You know when you’ve had a bad week and you don’t feel like anyone cares? 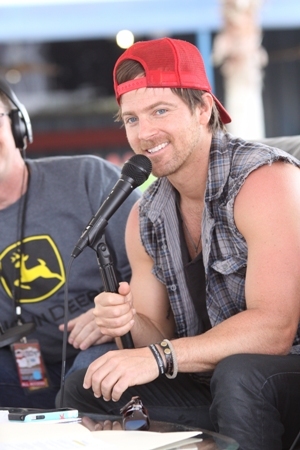 Kip Moore does. And he shows you what you could have with him. But he made me feel that way, so I’ll believe what I want, and you can see for yourselves when you watch his latest music video. He may have debuted the video on Late Night with Jimmy Fallon, but this video is no laughing matter. If country music doesn’t charm you already, this song will. It’s sung to a girl and lovingly addresses every want the singer has and the belief he has in their love. The video depicts an array of couples through the ages. It captures those delicate moments, from hand-holding to leaning on shoulders, that perhaps we now take for granted. It’s as though the director of the video found the secret to love: it’s appreciating those little moments. It’s so simple, and perhaps that’s the reason why it resonated so deeply. What I took from it is that this type of love does exist and you must set your standards accordingly. It gives you hope for that real love that lasts through the ages. It gives you hope for someone who needs you that bad and loves you so tenderly. If Justin Timberlake‘s latest video for “Mirrors” pays tribute to a great love, this is filmed in anticipation of it. The couples are so inextricably connected it’s hard to believe they’re acting! But I think the takeaway is that this is no fantasy. It’s also adorable watching Mr. Moore sing along, because his puppy dog eyes and lit-from-within stares are a bit giggle-inducing. So, readers, press play and send a comment my way letting me know what you think.